The precision gaging amplifier (PGA) is a solid state, compact, and easy to use unit for obtaining dimensional gaging measurements. 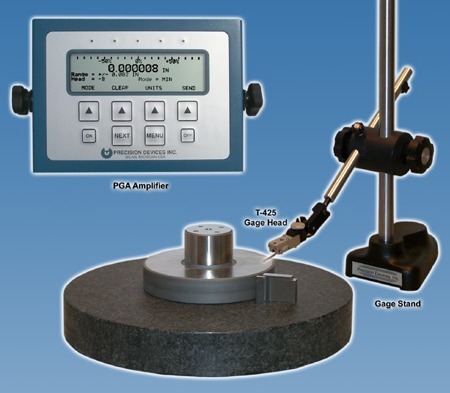 The PGA is used in conjunction with a stationary gage head where the part to be measured is placed under the gage head and manually moved to make the measurement. The amplifier applications include surface plate work, run out, height gage indicator, size variation, and set-up verification. For ease of operation, a visual indication can quickly be obtained by setting measurement limits for the LEDs located across the top of the unit. The LEDs limits can be set to determine whether a part is within tolerance, close to the limits set, or out of the tolerance range. The PGA utilizes a large display and menu driven software that is both self-explanatory and prompts the user through set-up and measurement screens. Additionally, rear panel ports provide both serial data and analog voltage outputs for driving auxiliary devices. The PGA amplifier has many features and functions that allow configuration of the amplifier and display of the measurement data in different formats depending upon the application. These features not only make the amplifier easy to use but provide excellent resolution for precise measurements. 240 x 64 pixel graphical LCD display. Software adjustable display contrast settings. Concurrent display of bar graph, numerical value, head (transducer) configuration, range, etc. Selection of displayed values in inches or millimeters (mm). Single channel (PGA-210) or Dual channel (PGA-220) versions. Reads heads A, B or both on PGA-220. Head A only on PGA-210. Independent polarity configuration for head(s). Display of ACTUAL, MIN, MAX, FIM (full indicator movement) or AVERAGE readings. FIM may be referred to as TIR (total indicated reading). Single key zeroing of ACTUAL head readings. Single key clearing of MIN, MAX, FIM and AVERAGE data. Calibration wizard for electronically calibrating each gage head using stepped height changes. Calibration wizard for calibrating the analog output. Storage of all settings for up to four users or part configurations. Power cord for 220-250 volts, 50 Hz. 0 to 0.3g ± 0.020"
5/32" Dia. Carbide Tip with #4-48 male thread 51g (at null position) 0.040"